My cup runneth over! Those were the words that came to mind a couple of days ago as I took stock of all the exciting things that will soon befall me in the coming days, weeks and month. You’ve heard of “Christmas in July”…well, this is starting to look like “Christmas in the entire fourth quarter of 2011.” It’s just non-stop activity from now through the new year…the arrival of our son Connor, lots of toys (for both the baby and his parents!) and plenty of one-of-a-kind family memories to create and share. I even came into some lightweight web design sidework last night, the payout for which will get me the rest of the way to my goal for the new stereo I’ve been lusting after for the GTO. I can’t afford one of those fancy-pants touchscreen head units with nav built in — and most of them have some pretty crappy navigation, anyway, unless you pony up for the top-end models — so I’m going with a more rudimentary [amazon_link id=”B003EO8UNI” target=”_blank” ]JVC KW-XR810[/amazon_link]. It’s got just the features I need: iPod control, multiple USB ports, and Bluetooth music streaming at last! The big gadget news for today is Apple’s iOS 5.0, which Apple and I are both currently installing on our iPhone 3GSes. This is the biggest iOS refresh since the App Store was introduced, and Apple’s servers have been getting hit hard all day as tons of iPhone users all over the globe downloaded and installed the upgrade. There’s some cool stuff in this one, but perhaps my favorite new feature of all is the ability to finally — finally — assign our own custom sound effects for text messages, email alerts, calendar alerts and lots more. I had that ability on my Motorola E815 flip phone in…what, 2004?…so there’s really no excuse why Apple took so long to give us this capability, but at least it’s finally here. With me being a big sound effects guy, I’m going to have some fun with this. Speaking of iPhone news, my 32 GB iPhone 4GS should be here within 48 hours — and, possibly, even tomorrow. I’ve got a UPS tracking number in hand, but it’s not registering in the UPS system yet. However, the tracking number indicates a service level of “01”, meaning Domestic Next Day Air. This means that the phone is coming from the U.S., and because I ordered it from AT&T directly, that means it’s likely coming from their Fort Worth, TX warehouse. The great thing about that is, Fort Worth is only a couple hours’ drive from my house. If anybody’s likely to get their phone early, it’s me. So I’m going to work from home tomorrow and hope to catch the UPS guy when…and if…he stops by. We’ve also got a really cool play yard (formerly known as “play pen”) for Connor arriving via UPS tomorrow, so it’s likely to be a big day! I mean, that list reads like a “who’s who” of famous Pontiac hot rods from the last fifty years. I’ve died and gone to Tin Injun heaven. Naturally, I’ll have a full review of Forza 4 in the coming days (I’ve only spent a couple hours with the game so far), but I could literally stay busy for years playing this. 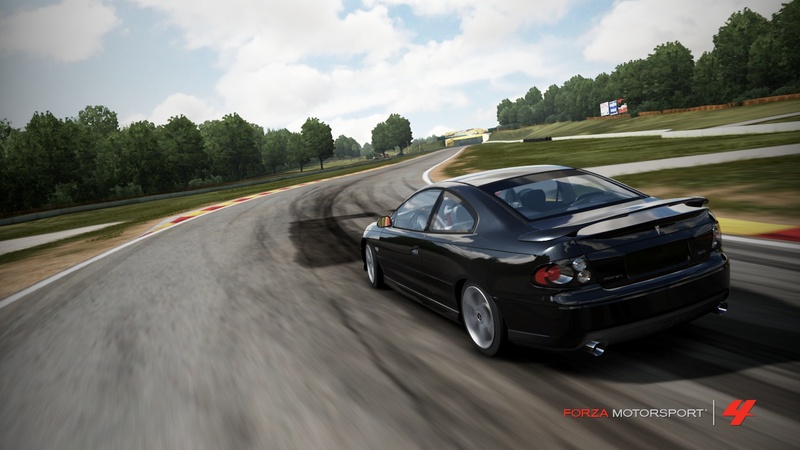 I’ll leave you with this final parting shot of my GTO gobbling up a turn at Road America. Plenty more where this came from! You will love the ability to have streaming radio in your car. I really enjoy it in mine – although it works very erratically because there’s something fishy with the Sync. I tried grabbing iOS 5 last night, but server shenanigans prevented me from getting it (actually, not quite — I downloaded the update, but got a “restore error” because I guess the update had to be validated with Apple’s servers, and that wasn’t happening). Managed to get updated this morning, though. It was hilarious reading some of the “fixes” people on Apple’s discussion boards were giving to get around the errors though — unplug all of your USB devices! Turn off your firewall! (Just don’t forget to turn it back on!) Wipe your phone and restore, then update! I heard a ton of errors with the iOS 5 update being reported yesterday, most often the “Error 3200” or whatever it was. A lot of people calling the update a complete clusterfrak. I think you’re right that a lot of it had to do with Apple’s servers being overloaded. The only unusual thing that happened on my end was that the update seemed to take FOREVER. It didn’t help that I took a manual backup of the phone before starting, and then the upgrade process decided to do another one for me. You really have to take advice in Apple forums with a grain of salt, as you’ve got a seemingly inordinate number of people flying off the rails on all kinds of ridiculous tangents when things go wrong. Really uncanny. Glad you finally got the update though. Apple and I are loving iMessage — no more texts coming out of our allowance when we chat with each other. I haven’t put all of my swee/fa custom text sound effects on there yet, but I have a few on there that I’ve actually had there since I got my first iPhone (only to realize later that I couldn’t use them!). Yeah, I ended up getting Error 3173, which was some sort of Restore error. I dunno. My update process was weird. Like I said, I actually downloaded the update last night (which probably took a little over an hour), but then I got hit with the error, so iOS didn’t update (I guess I was kind of lucky, seeing as I read about other people whose iPhones sometimes bricked because of the errors). Then this morning I plugged the phone back in to update, which iTunes promptly set about doing (thankfully, it recognized I had downloaded the update already so it didn’t try to download it again). Then iTunes decided to restore my phone back to the factory settings (!) before doing a restore and updating everything…but in the end, I had iOS 5 on my phone. I haven’t tried dorking around with too much — and you’re pretty much the only person I know with an iPhone, so iMessage doesn’t do much for me at the moment — but it seems pretty nifty so far.